In my response to these questions, I want to use a national Australian political lens as we all stare down the barrel of a new government likely to be elected in two months time with a commitment and a mandate to stop the boats which are arriving in numbers we Australians have not known before. 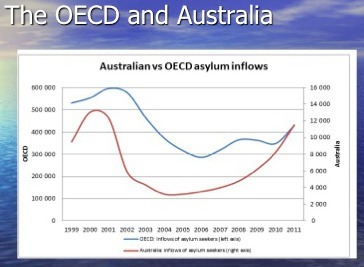 Pragmatically, and with only limited time, I want to outline the contours for a better approach here in Australia — better than committing to forcibly turning around boats on the high seas, à la Abbott, and better than transporting people to Nauru and Manus Island for processing or to Malaysia to join an asylum queue of 100,000 or permitting people to reside in the Australian community but without work rights and with inadequate welfare provision under the rubric of a 'no advantage' test, à la Gillard. Outlining these contours, I want to defend the Refugee Convention and urge that Australian political leaders of all ilks maintain a commitment both to the Convention and to onshore processing with minimal detention and adequate rights to work and welfare while awaiting processing in the community. Hopefully any changes adopted can be worked against a backdrop of our providing at least 20,000 humanitarian places a year in our migration program, 12,000 of those being for refugees. The government has been unable to provide any details as to how the 'no advantage' policy will operate in practice. It remains a vague and ill-defined principle that risks creating a complex framework with insufficient transparency. It has resulted in a confusing array of measures focused not so much on the status of the person as their mode and date of arrival in Australia. The committee is concerned about the practical consequence of the application of the 'no advantage principle', which would appear to be either a deliberate slowing down of processing applications for refugee status or deliberate delays in resettlement once a person has been determined to qualify as a refugee, inconsistent with the prohibition against arbitrary detention in article 9 of the ICCPR. In this respect the committee notes that as of late May 2013, some nine months after the adoption of the policy, processing of the claims of those who arrived by boat has not commenced in Australia or PNG and that there have been only preliminary interviews of some of those who have been transferred to Nauru. A failure to put in place such procedures for persons held in detention for such periods appears to the committee to constitute arbitrary detention of those who have been held for an extended period. #31 — The Contracting States shall not impose penalties, on account of their illegal entry or presence, on refugees who, coming directly from a territory where their life or freedom was threatened in the sense of article 1, enter or are present in their territory without authorization, provided they present themselves without delay to the authorities and show good cause for their illegal entry or presence. #33 — No Contracting State shall expel or return ('refouler') a refugee in any manner whatsoever to the frontiers of territories where his life or freedom would be threatened on account of his race, religion, nationality, membership of a particular social group or political opinion. Three years ago, Patrick Keane, Australia's newest High Court Justice spoke at Monash University describing the Book of Deuteronomy as 'an example of a shared national morality that inspires its people to be generous, even to strangers. The idea is that we should treat everyone who comes within our borders, including complete strangers afflicted by misfortune, not just with respect and dignity, but with generosity, because we too have — at some time — been ourselves saved, without any particular merit on our part, from the misfortunes which are part of the human condition.' The descriptor 'illegals' does not help. Let's now consider Jeff's third question: Can alternative (and better) approaches be found? Persons who reach Australia whether by boat or by plane, whether with or without a visa, should be detained onshore only for the duration of health, security and identity checks. They should then be released into the community being permitted to work and being eligible for social welfare assistance. Just as Australia has long prided itself on providing a just wage and an adequate welfare safety net for all persons living in Australia, so too we should not drop our standards for those asylum seekers in the community awaiting processing. Just as people living in neighbouring countries do not have an entitlement from the Australian government to the same living standard as the poor and welfare dependent in Australia, Australia has no obligation to provide the same welfare assistance to asylum seekers resident in other countries. Fr Frank Brennan SJ is professor of law, director of strategic research projects (social justice and ethics), Australian Catholic University, adjunct professor at the College of Law and the National Centre for Indigenous Studies, Australian National University. He gave this to Jeff Crisp's paper 'Get back to where you once belonged!' at the National Asylum Summit, University of South Australia, on Thursday 27 June 2013. Resettlement options in Australia could include using the existing parish structure. A coordinated procedure could see the Australian Catholic Bishops leading the way in each parish supporting a family for six months. Informal job opportunities may evolve locally. Mercy and justice could be exemplified. Muslims and Christians could meet and sound citizenship be encouraged.We need leadership in this matter. We are not allowed to send anyone back to Indonesia because that is refoulement no matter how you spell it out. And it's amazing how this lie of secondary movement invented by Ruddock has been abused, there is simply no such thing Frank. It is never used against those who flew over or through dozens of other countries. I am sick of this nonsense, the fact is that we do not own the oceans, or Indonesia, or the borders of the world so as Richard Towle rightly points out people have a right to enter. And don't forget that in 1992 the convention was added to the migration act and all offences for entering without papers were removed as shown by the high court in Al Kateb. Indonesia is torturing and killing refugees, didn't you read yet another damning report from HRW this week? It is only secondary movement if people have genuine protection from persecution and full rights, that does not happen in any country in our region so that argument has always been nonsense. Marilyn quotes the evidence by Mr Ric Towle, the UNHCR representative, to an Australian parliamentary committee on 15 October 2008 (when the stream of boats was nothing compared with what it is today). Later in his answer, Towle said: "UNHCR fills the gap a little in Indonesia, as you know, and in Malaysia, but those countries do not have any regulatory framework at all to protect refugees. The problem for us is how we keep the gates open here for those who need it but also encourage states further up the people movement chain, if you like, to do the right thing there. That is something that is a long- term work in progress for us. Article 31 hints at those kinds of issues." That's what we are all wrestling with now. Bob Carr wrongly classifies most of those 25,000 who arrived by boat this past year as economic migrants. Marilyn treats most of them as refugees engaged in direct flight. I think most of them are refugees and that those who are refugees could properly be classed as being engaged in secondary movement if there was adequate UNHCR supervised protection and processing for them in Indonesia. If there were, we would be entitled to fly them safely back to Indonesia for that protection and processing, then being committed to doing our share in the region with resettlement of proven refugees processed in places like Malaysia and Indonesia. But refugees in Malaysia and Indonesia are tortured and just because the UNHCR is there doesn't mean protection. And there is legally no such thing as secondary movement, Ruddock made that up. Because if such a thing existed no refugee would ever get past the 1 country and that is not the reason for the refugee convention. IN NAGV and NAGW the high court made it plain that jews didn't have to go to Israel just because they were allowed to. Frank, there are 8 million refugees in our region, we think we can accept 20,000 and then pretend we can fly them back and forth like we own them. Don't be so absurd. Many thanks Frank, for your very considered response to my presentation, which, I should underline, was targeted at the industrialized states generally and not at Australia specifically. I understand completely Jeff. Your general challenges to industrialised states resonated strongly with your Australian audience. It is reassuring to note the joint communique today from SBY and Kevin Rudd: "As co-chairs of the Bali Process, the two Leaders reaffirmed their commitment to continue to develop a regional solution, involving countries of origin, transit and destination which covers elements of prevention, early detection and protection, to combating trafficking in persons and people smuggling and other related transnational crimes. They stressed the importance of avoiding unilateral actions which might jeopardise such a comprehensive regional approach and which might cause operational or other difficulties to any party. The Prime Minister of Australia welcomed Indonesia’s initiative to invite key origin, transit, and destination countries to a conference to explore concrete operational and policy responses, including regional approaches and efforts to enhance border security, in addressing irregular movement of persons. " Would I be right in thinking that Frank Brennan's "Indonesian solution" suggested above is similar to the Government's "Malaysian solution"?